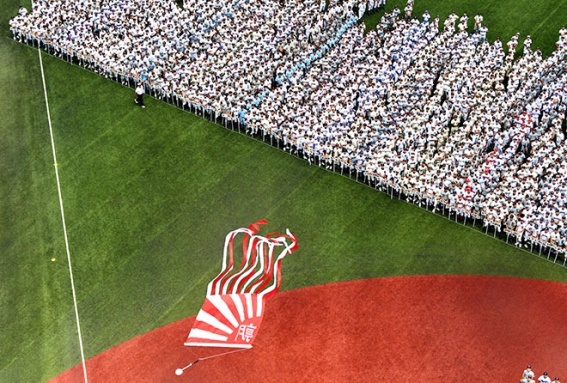 Baseball teams line up in Tokyo's Jingu Stadium on July 1 for the opening ceremony of the regional competitions of eastern and western Tokyo for the National High School Baseball Championship. The Asahi July 2, 2018　-　Baseball is not Japan's national pastime anymore, which is a concern shared by a majority of high school baseball coaches and club supervisors, according to a nationwide survey. The survey, conducted once every five years by the Japan High School Baseball Federation and The Asahi Shimbun, showed that more than 70 percent of respondents believe that the popularity of baseball in Japan may have been eclipsed by other sports. The result of the survey, involving about 4,000 high schools registered with the federation, is a clear manifestation of the dramatic shift in the perception of the sport's declining popularity among high school baseball educators over the past decade. In surveys conducted in 1998 and 2008, 52.8 percent and 55.8 percent of coaches or club supervisors, respectively, responded, “I don’t think so,” reflecting their belief that the game remained the country's most popular sport. The ratio of those who “don’t think so” was surpassed by the total of “possibly” and “already” for the first time in the last survey in 2013. The total has increased to 73.9 percent in this year’s survey. On June 29, the federation reported that the number of students belonging to high school baseball teams as of the end of May was 153,184 across Japan, a drop of 8,389 from the previous year. It was the biggest drop in a year since the federation started tracking the number in 1982, and the first time in 15 years the number has fallen below the 160,000 mark. The drop in the number of baseball players is more severe among elementary and junior high school students.